Autumn best season is almost here, and what better what better way than to enjoy it, is with these Upcoming East Sussex Bonfire Night Firework Events. Here is your Grand fireworks events selection for 2019. Why not come and join us on the Seasonal Forum. Where you can find more events in Sussex, and deals from our sponsors, with help from our excellent community. Time: Starts, 7:15 pm, Fireworks, 9:00 pm. Venue: 16 White Rock, Hastings, TN34 1JY. What’s on Local Fun, Drinks, Fireworks. What’s on Fireworks, food, Bars, Good Fun. Venue: Staple Cross, East Sussex, United Kingdom. What’s on Procession will start at 19:30 pm, massive bonfire and fireworks, Food available either outside the Cross Inn or on the bonfire field, burgers, hotdogs, lush candy floss. Price: Entry onto the bonfire field is just £1! ALL monies raised through the gate go to local charities and shared out between them at our carol service in December. Venue: Icklesham Main Rd, TN36 4BD. What’s on: Family friendly event, lush food, drinks, fireworks. What’s on: Fireworks, food, drinks, great fun. What’s on: Enjoy a great tradition. What’s on Local Fun, Drinks, food, Fireworks. What’s on the bonfire, Drinks, food, Fireworks. Venue: Mayfield and Five Ashes. What’s on Torchlit Procession, food, Fireworks, local fun, Fairground and much more. Venue: Church Lane, Ninfield, TN33 9JN. Time: Starts, 7.30pm – Midnight. What’s on Bonfire, Fireworks, food great local fun. Time: 6:30 pm – 8:30 pm. Venue: Isfield Sussex TN22 5XB. What’s on This is a small village family bonfire society oriented event, Torchlit Procession with a Bonfire and Firework Display. Price: Free – Donations Accepted. What’s on: Torch lit procession. Venue: London Road, East Hoathly, Sussex, BN8 6QF. What’s on procession, Drinks, food, Fireworks. What’s on Bonfire Procession and Fireworks. Time: From 20:00 – 21:30. Venue: Grand Parade, Eastbourne, East Sussex, BN21 3AD. What’s on Halloween theme, music from the 60s, 70s, 80s, 90s and naughties, dancing, singing, Fireworks. Venue: White Lion, Claremont Road. What’s on: Procession, Drinks, Food, Fireworks. Venue: The St, BN8 6NS Lewes, East Sussex. What’s on: Torchlit Processions throughout the village From 19:00, Fireworks in the fire site21:30 Approx, FREE PARKING, LICENSED BAR & HOT FOOD. Price: Entry, Adults £5 Accompanied Children Under 13 Free. What’s on: parades, pubs, bonfires, Fireworks. What’s on:Bonfire, procession and fireworks. What’s on: fab fun, procession and fireworks. What’s on: Great night, fireworks and much more. What’s on: fantastic night parade, fireworks. For a safe fun night at any of these East Sussex Fireworks Displays Round Up 2019, Please follow the rules, as most displays do not allow to sell or buy fireworks or allow animals. Please take extra care if you are attending on your own, take the extra money and a mobile phone for emergencies only. Did you enjoy this post? Please share it with your friends. Would you like more? 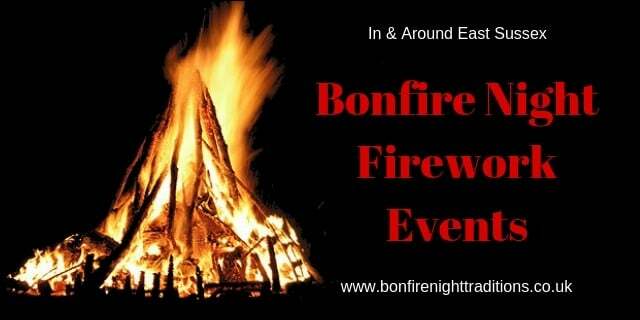 join us on the Bonfire Night Firework Displays in East Sussex Facebook group. Share where all the latest East Sussex events are happening.